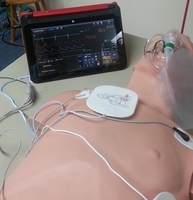 New Simulators for ACLS/PALS Classes! New updated website launched 07/14/13!!! We will have a vendor booth set up at the 68th Annual Meeting of the New England Assembly of Nurse Anesthetists located at the Burlington Marriot in Burlington, MA on April 10th & 11th, 2015. For more information about the upcoming meeting, click HERE. We will be available to answer any and all questions regarding training for any American Heart Association program and specifics about our training centers located in Wakefield, MA, Windham, NH, Parkland Medical Center in Derry, NH and Portsmouth Regional Hospital in Portsmouth, NH. For information about our training center or to enroll in an upcoming class, follow this link to our website. Any questions or comments, please feel free to contact us at (603) 890-3533.